In 2015 Halifax SWCD purchased a Great Plains 1006NT drill. This drill has a 10 ft planting width and can plant all types of grain or grass seed. This drill also includes a Native Warm-Season Grass box that was partially sponsored by Lake Country Quail Forever. This attachment provides landowners with the opportunity to install hard to establish species of plants that can’t be planted with conventional drills. The Great Plains drill has turbo coulter followed by double disk openers which mean it will do well in thick residue and pasture reseeding situations. This drill requires a 70 hp tractor. In 2016 Halifax SWCD acquired a roller/crimper as a gift from Piedmont SWCD. The roller/crimper was originally acquired through a grant through the Chesapeake Bay Foundation. 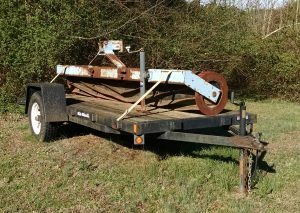 This piece of equipment is 10 ft wide and hooks up to a 3-point hitch of a tractor. 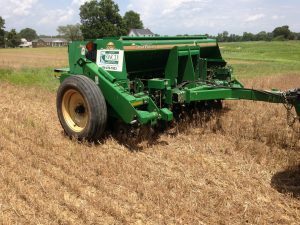 It can be used to roll most types of standing cover crops to terminate and provide a mulch layer.